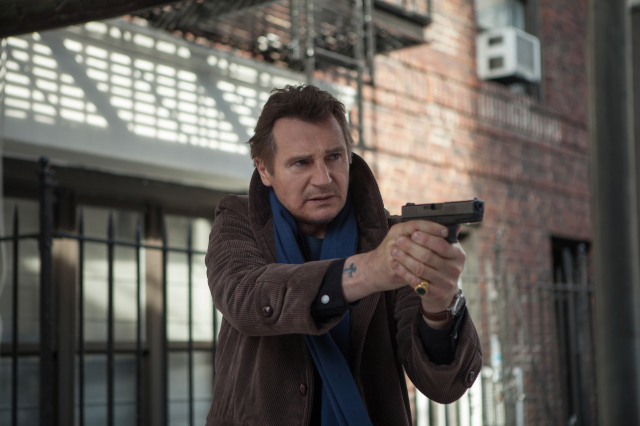 Pierce Brosnan strutted his “older man of action” stuff recently in The November Man and now Liam Neeson, the definitive “older man of action” of the moment, is at it again in A Walk Among the Tombstones. 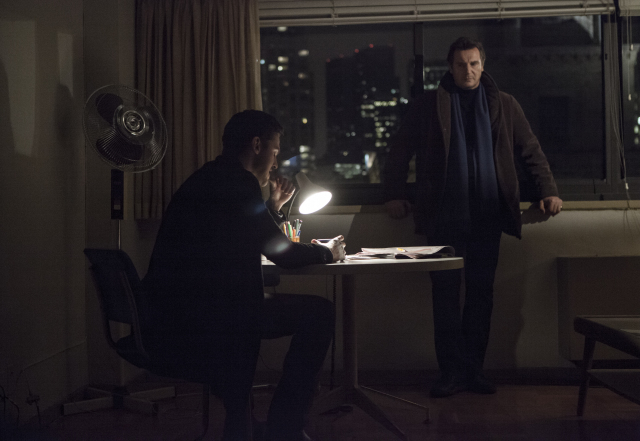 Neeson plays Matt Scudder, a former NYPD cop, now an unlicensed private detective and a recovering alcoholic. Drug dealer Kenny Kristo (Stevens) engages Scudder’s services when his wife is kidnapped and killed even after he’s paid the ransom. While doing research in the library, Scudder befriends homeless teenager TJ (Bradley), whom he takes under his wing. Scudder discovers that the psychopaths responsible are targeting young women related to figures in the drug world, knowing they would be unable to go to the police for help. Working outside the law, Scudder must prevent the serial killers from striking again. 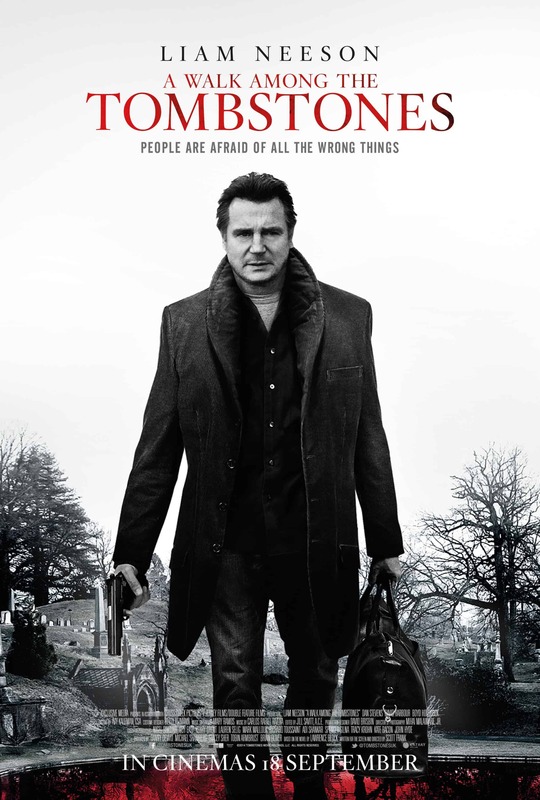 A Walk Among the Tombstones is adapted from the 10th book in Lawrence Block’s long-running Matt Scudder series (there are 17 books now). Jeff Bridges played Scudder in 1986’s heavily panned and largely forgotten 8 Million Ways to Die and this film has been in the works for quite a while, with Joe Carnahan attached to direct and Harrison Ford to star at one point. 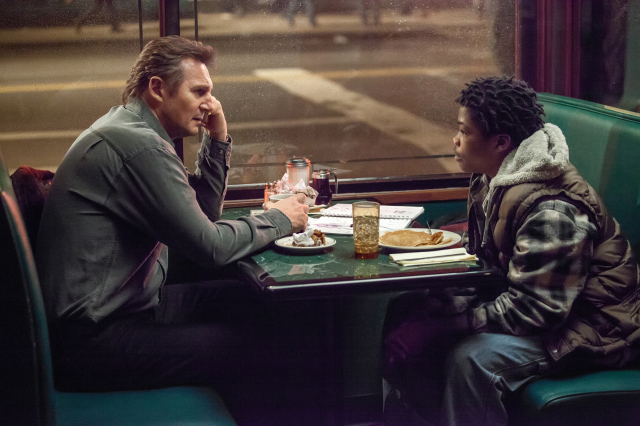 Writer-director Scott Frank’s realisation of A Walk Among the Tombstones is slick, stylish and foreboding, lean and effectively chilling. At times, it seems reminiscent of David Fincher’s work, if more pedestrian. A slow-motion sequence in which the killers leer at a young girl walking her dog, set to Donovan’s “Atlantis”, is a very darkly comic touch. The book was published in 1992, but Frank chooses to set it in 1999, hinting at Y2K paranoia with the symbolism of people being “afraid of all the wrong things”, as the tagline goes. This doesn’t seem to add a lot to the story but it is an interesting textural detail.